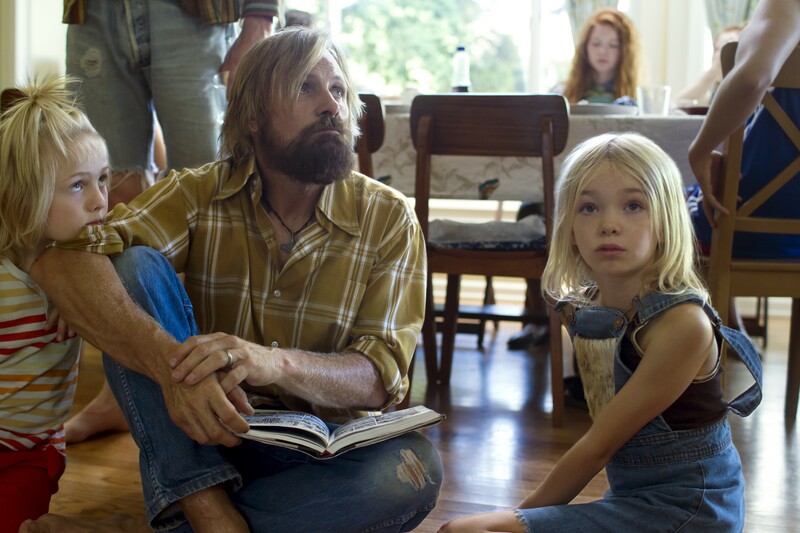 Viggo Mortensen shines as the ultimate hippie eco-survivalist family man. Anyone who has spent time in Northern California, or elsewhere in the “ecotopia” culture of the Pacific Northwest, has probably known a family something like the one headed by Ben, the patriarchal main character played by Viggo Mortensen in Captain Fantastic. Ben and his six kids — the mom has recently died in a hospital, offscreen — live in a cluster of cabins and lean-tos deep in the piney hills, hunting, gathering, and living off the land, and off the grid. Ben is the sort of lean, wiry, bearded outdoorsman of few words but decisive action that can sometimes be found around a campfire, strumming a guitar, or in a homeless encampment or a back-to-the-land collective. That is, in the latter case, after he has already hunted, killed, and field-dressed a deer for the family larder. The children, ranging from college-age down to about second grade level (if they were enrolled in school, which they are not), have homemade names like Zaja and Vespyr, and each of them carries his or her own hunting knife. Their informal education is rigorous but effective, as is the daily regimen of physical endurance training led by their father. The whole family sneers at organized religion and supermarkets, and faithfully celebrates Noam Chomsky Day. The youngest girl has built a shrine to Pol Pot. Just before bedtime, each of them quietly reads a book by the fire. The tone of their lives has been set by their late mother, who proclaims in a letter: “Our children shall become philosopher kings.” Everyone in the family, especially Ben, misses her tremendously. We can also see that these bright, theoretically capable kids are missing out on the social interaction they naturally don’t get from being home-schooled in a remote rural setting. Matt Ross, the writer-director of the film, evidently knows something about free-thinkers like Ben and his brood. Actor-turned-filmmaker Ross, a Berkeley resident, lived in Oregon before moving on to acting jobs on TV (Silicon Valley; American Horror Story) and in such movies as Whit Stillman’s The Last Days of Disco. He has an irresistible bunch of young faces to work with in Captain Fantastic, and we’re treated to some poignant scenes as Ben’s children take their first baby steps among the general population. Oldest son Bo (English actor George MacKay) hits it off with a teenage girl in a trailer park, but first has to overcome his lack of youth-culture know-how — no one in the family owns an electronic device of any kind. On their way to their mother’s funeral, Ben and his kids take an awkward bath in the waters of “typical American” life with their relatives (personified by ace supporting players Kathryn Hahn and Steve Zahn), who can barely tolerate their eco-hippie cousins. The feeling goes both ways: “We do not make fun of people,” observes one of Ben’s kids. “Except Christians,” comes the reply. Meanwhile, disapproving Granddad Jack (Frank Langella) practically closes the iron door on his six grandchildren. Nobody said it would be easy living the rebel life. The glue that holds Ross’ interpersonal drama together is, of course, one of the finest character leading men in the business. In a filmography full of vivid personalities doing startling and often dangerous things, Mortensen has impersonated everyone from a Tolkien fantasy figure (in four Lord of the Rings adventures) to a Russian gangster (David Cronenberg’s Eastern Promises) to a Patricia Highsmith con man’s victim (The Two Faces of January) to a New Mexico gunslinger (Appaloosa) to Sigmund Freud (A Dangerous Method, again for Cronenberg) — all the while seeming born into his roles. The part of Ben the non-conformist dad gives Mortensen a chance to do something difficult: imagine a strong, principled naysayer who nonetheless can recognize that his chosen way of life might not necessarily make his children any happier or more fulfilled after all, even when their ethos has been inspired by an idealistic mother whom they all adored. It’s one of the most gratifying performances of the year, in a movie to remember. To the Woodman, re: Café… Bourne? Again?